A review in 10 words (or thereabouts): Everyone has their secrets. When her best friend Meg drinks a bottle of industrial-strength cleaner alone in a motel room, Cody is understandably shocked and devastated. She and Meg shared everything - so how was there no warning? But when Cody travels to Meg's college town to pack up the belongings left behind, she discovers that there's a lot that Meg never told her. About her old roommates, the sort of people Cody never would have met in her dead-end town in Washington. About Ben McAllister, the boy with a guitar and a sneer, who broke Meg's heart. And about an encrypted computer file that Cody can't open - until she does, and suddenly everything Cody thought she knew about her best friend's death gets thrown into question. I was hoping this book would get me out of my reading funk and it did. I knew I could count on you Gayle Forman. Unfortunately it wasn't a happy book. Not at all. Absolutely the opposite, but like most books that aren't happy books, at least most teen books, it's a hopeful story. Cody is the one left behind. She was left behind, in a sense, when Meg went off to college, and now she's been left behind when Meg decides to take her own life. What happens to those left behind? What happens to those who want to understand? Who seek solace where there is none? Who feel guilt and loss that burrows into their very being? That's what I Was Here is about. It's about the seeking and heartache of the after. And it's about finding forgiveness for yourself when the world comes crashing down. Meg's story is also a bit of a public service announcement about suicide and mental health. Forman is never preachy. Instead, the story serves as a reminder that depression is real, it's personal, and it knows no age. 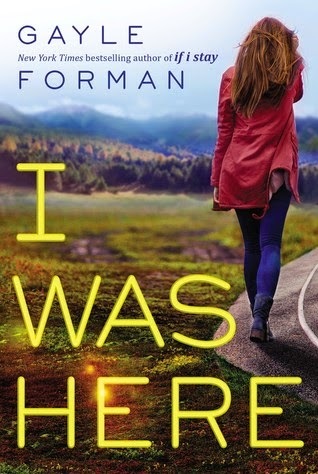 Here's what I like most about Gayle Forman's characters...her characters are broken. I know that sounds disturbing, but she's consistent in that all of her characters are broken in some way. There's no one that has everything together and makes everyone else look bad. Her characters are real. They're dynamic. Many come from broken homes, have known struggle. Cody was a bit broken way before Meg took her life just as Ben was broken before she stepped into the club in Seattle. But all of her characters are fighters. They've learned to stand on their own two feet so that their brokenness doesn't define them. So there's hope in the end. Forman is good at hope. Just a heads up, there's quite a bit of choice language in this one. It's not necessarily gratuitous, but sometimes it feels harsh and...much. It was definitely enough that I noticed. Sidenote: Has anyone else noticed a trend in poor proofreading before publication? Words left out of sentences...missing punctuation? It always takes me out of the story when I come across one. Kind of annoying.